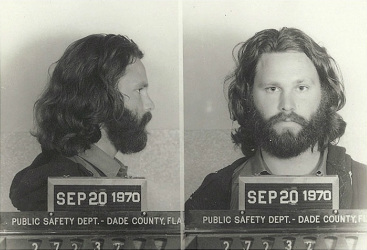 Jim Morrison's most famous Florida moment was his September 1970 conviction in Miami on charges of indecent exposure and profanity. But the legendary singer of The Doors was connected to Florida in numerous other ways, beginning with his December 8, 1943 birth in Melbourne to Clara Virginia and George Stephen Morrison. His father was a Naval officer and the family moved often. When he was a teenager, Morrison lived with his grandparents in Clearwater and he attended classes at St. Petersburg Junior College before transferring to Florida State University in Tallahassee. While there, he appeared in a student recruitment film that was re-discovered a decade ago among others donated by the university to the State Archives of Florida. In September 1963, he was arrested in Tallahassee and charged with stealing a police helmet and umbrella, disturbing the peace, resisting arrest and public drunkenness following an FSU football game. The obscenity trial in Miami stemmed from a Doors concert at the Dinner Key Auditorium. Police say he rolled down his pants and exposed himself. Morrison's attorney said the act was simulated and that the arrest was an effort by the city's conservative political establishment to strike a blow against hippie culture. The trial became a media circus that lasted from mid-August to late September. Even after then-Gov. Charlie Crist issued a posthumous pardon of Morrison in 2010, surviving members of The Doors remained bitter about the incident, responding in a joint statement by Robby Krieger, Ray Manzarek and John Densmore that Morrison didn't need to be pardoned for anything. The arrest ruined a planned 20-city tour as every city booked for the tour canceled their engagement. 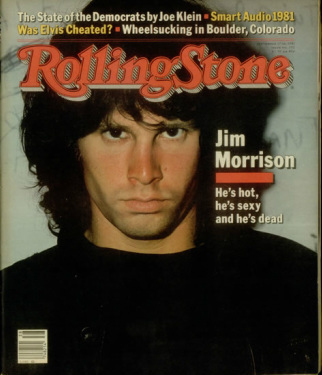 "A circus of fire-and-brimstone 'decency' rallies, grand jury investigations and apocalyptic editorials followed -– not to mention allegations ranging from the unsubstantiated (he exposed himself) to the fantastic (the Doors were 'inciting a riot' but also 'hypnotizing' the crowd)," the band's statement said. "The charges against him were largely an opportunity for grandstanding by ambitious politicians -- not to mention an affront to free speech and a massive waste of time and taxpayer dollars." Morrison's death in Paris of heart failure wasn't announced until several days later because family members and supporters wanted to avoid the circus that followed the deaths of Janis Joplin and Jimi Hendrix. In their joint statement, the surviving Doors members noted that Morrison was in the midst of his appeal of two misdemeanor convictions for which he had been sentenced to six months hard labor at Raiford Penitentiary.